Photo by @amosnachoumphotography “When the seal reached open water, I followed him moving in parallel and watching every action. To my surprise, the seal let the penguin go twice. 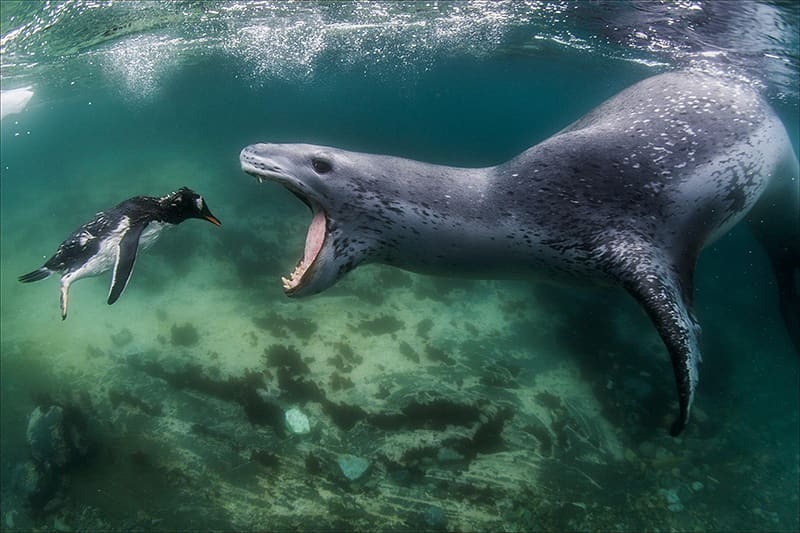 Each time the seal chased the penguin, the seal seemed to enjoy the game. The penguin was terrified. The seal caught him a few times and eventually drowned the penguin. The seal shook his victim violently in and out of the water stripping all the feathers off and then he preyed on the penguin’s raw exposed skin. "Facing Reality was voted category winner for Animals in their Environment and Love on the Rocks received honorable mention. I find that explanation of this pic fascinating. I've always wondered about this photo and wanted to know more. Now that I do it makes me curious about animals. The seal was playing with his prey before devouring it. Is this simply a part of its instinct or is it an act of intelligence? If it's intelligence then can we say that it's malevolent? Eating to survive is one thing (instinct), toying with your prey (intelligence) is something else entirely.